Elevator Stranger: What book are you reading? Me: Ummm... It's All Relative by Wade Rouse. Elevator Stranger: Who is Wade Rouse? Me: Oh, he's a well-known humorist/memoirist. (Obviously this person doesn't read humor or memoirs I thought to myself.) I've known him for awhile now, but this is the first book of his I've ever read. Elevator Stranger: Is it any good? Me: I haven't read much of it yet, but thus far I'm really enjoying it. Elevator Stranger: Why do you like it? Me: Besides the fact he's a really good writer? The stories in it are funny and poignant AND they make me feel better about my family holidays. My last comment made my elevator companion laugh, and I complete understand why. However, when I say the stories made me feel better about my own family I say it with love, and in a good way. Let's admit it, all families have their own unique dynamic and though each gathering is unique in and of itself they all seem to play out in a similar fashion. Over the years several "outsiders" (some of whom are now "insiders") have been brought into my families' established dynamic and when they were there was surely that initial "what will they think of it" question floating around in the back of our minds. After reading this book I no longer fear this question because what I learned is that at the end of the day a lot of us have the same insecurities about our family structures. 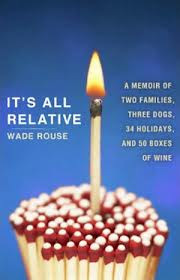 It's All Relative is a collection of Wade Rouse's holiday stories ranging from the traditional ones like New Year's, Thanksgiving and Christmas to the not so traditional ones - a Puppy Shower, Pez Collectors National Convention and Barbie's Birthday. Many of the stories jogged my memories of holidays past and made me want to e-mail Wade to tell him about my own experiences; however, I refrained. Instead, as Wade recollected Valentine's Day as a child, I flashed back to third grade (or maybe it was fourth grade) when I only gave Valentine's Day cards to those kids in my class that I liked - which apparently was a major faux pas! And I will never forget Wade's very touching stories about his Grandma Shipman and his mother as he reflected upon Mother's Day as an adult or about "The Wonder Years" in honor of Prevention of Cruelty to Animals Month and the very special dog that briefly wandered into Wade and Gary's life. This is the first book by Wade Rouse that I have ever read. Prior to It's All Relative, the only writings of his that I have seen are those that he writes for his Go-To-Gay column at Chick Lit Central, along with other online publications. Though I have laughed and cried while reading these pieces, I still went into reading this booking hoping--and praying--I liked it as much as I did his other works (because you just never know). The final verdict? Absolutely. If I wasn't laughing, I was holding back tears because I was moved by what I was reading. Sometimes, both occurred at the same time. Thanks to Wade Rouse for the book in exchange for an honest review.